Iskra Lawrence shares empowering message after NYFW debut | HELLO! Iskra Lawrence has seen her career skyrocket over the past 12 months, and she capped off an incredible year by making her catwalk debut at New York Fashion Week over the weekend. The plus-sized model, who has been outspoken about championing diversity in the fashion industry, walked in the show for swimwear and athletics brand Chromat. Iskra later marked the achievement by sharing a powerful message on social media in which she admitted she had regularly been told she wouldn't achieve her goals of modelling in the Big Apple. 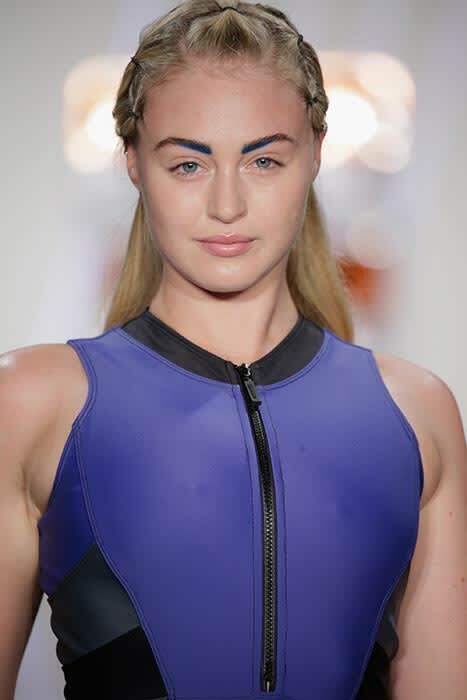 Sharing a photo of herself walking down the runway in a purple swimsuit and pool sliders, Iskra wrote: "Took these thighs down the runway yesterday for @chromat my first NYFW after 13 years of modelling. A few years ago I was doing shows in local malls and shopping centres being told I'd never get signed in NY. "So I did my damn thing yesterday for everyone who's ever called me fat, all the no's and rejections bc beauty is so much more than a size or shape or colour it's who you are and the light you shine." She concluded: "Thank you for everyone of you who's on this journey with me, I will always try to fight for more diversity and realness and share my experiences with you. I hope you all believe in yourselves and never give up on your dreams." Being true to herself is something Iskra is totally focused on, and she previously told HFM that this is a message she wants to pass on to other young women and girls. "As a model, I feel a great responsibility and I understand how an image can make a young woman feel," she told us. "I used to tear myself apart because of an image I'd seen so I want to do the opposite – I want to empower women and tell them that they're beautiful as well. If you have thread veins like me, why is that a flaw? "It feels good to put myself out there as I actually am. It makes me feel more beautiful because I know people like the real me, not the airbrushed, perfected me."